Occasionally, it may be necessary to reboot the server that runs SpecVet. This could be to install operating system updates, to remedy performance issues, to accommodate power outages, etc. 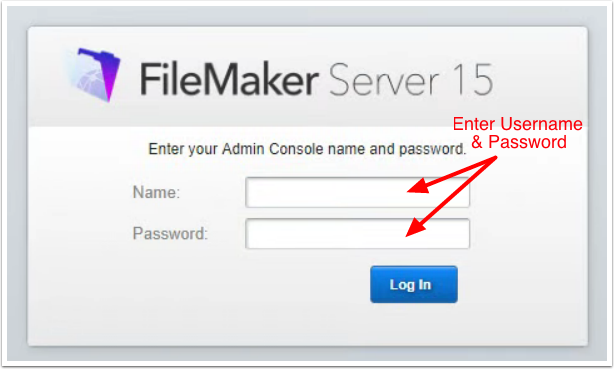 It is important that the FileMaker Server platform be shut down properly to avoid data corruption issues as well to significantly improve the startup time when the server comes back up. 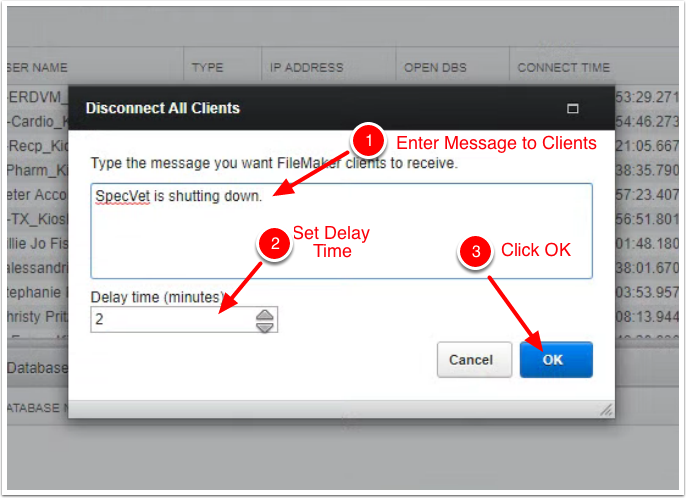 This document is designed to show you how to properly shut down the FMS/SpecVet server. An Uninterruptible Power Supply (UPS) is highly recommended for your SpecVet server. A minimum of 30 to 60 minutes of power is recommended. This will allow your IT staff or us adequate time to properly shutdown the server in the event of a power outage. IMPORTANT - Your staff must notify us or your IT staff immediately if you lose power for more than a few minutes. Failure to notify IT negates the benefits of having the UPS. Credentials can be obtained from SpecVet Technical Support. Supported browsers are Safari, Internet Explorer, and Chrome. 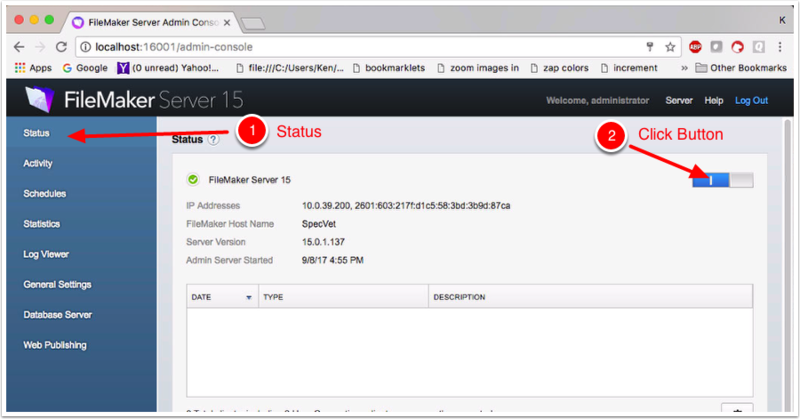 Enter http://localhost:160001/admin-console into the address bar. Use same credentials that you used to login to the server. This step prevents clients from immediately logging back into the server after being disconnected. Click Database Server on the sidebar. 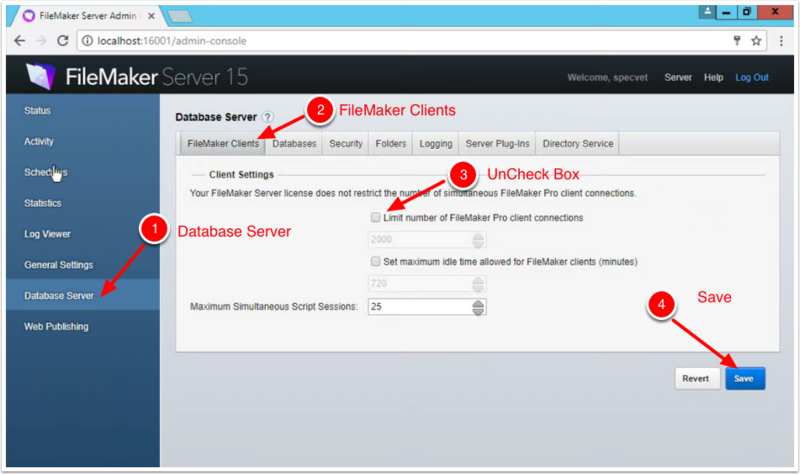 Select the FileMaker Clients tab (if not selected). Check the box to Limit number of FIleMaker Pro client connections. Set the number of connections to zero (0). 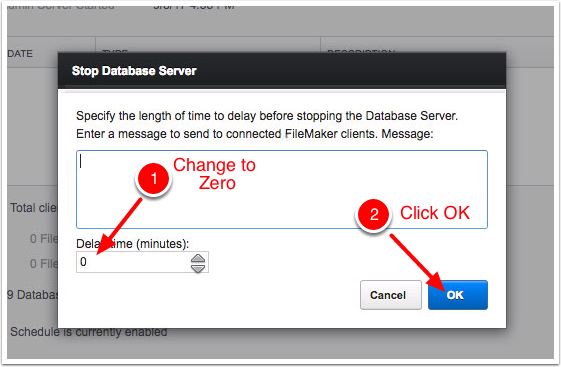 Disabling schedules will prevent automated FileMaker scheduled processes from interrupting or delaying the shut down. Select Schedules on the sidebar. Uncheck the box next to Allow enabled schedules to run. Clients must be disconnected to preserve file integrity. Select Activity on the sidebar. Click the envelope icon on the right side of the window. 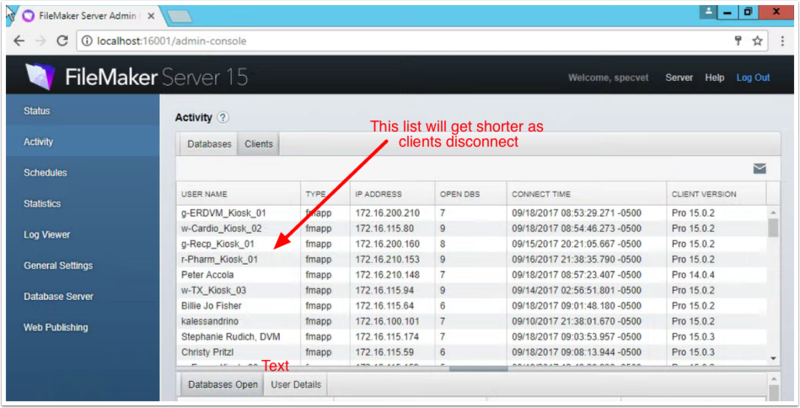 Select Disconnect All Clients from the drop down menu. A new window named Disconnect All Clients will open. Enter a message that will be sent to the clients. Enter the Delay time (default is two minutes). The delay time allows users to finish working and exit the database before being disconnected. Once the disconnect process has begun, clients should begin dropping off the server. Disconnection progress can be monitored from the Activity menu of the Admin Console. The client list will get shorter as clients drop off. Wait a few minutes to allow them time to disconnect. Attempt the disconnection process again. If some clients are still connected, continue with the process below. Running a backup is always a good idea when shutting down the database server. It's essential in the case where not all clients are able to be disconnected. Select Schedules from the sidebar. Select a backup to run. 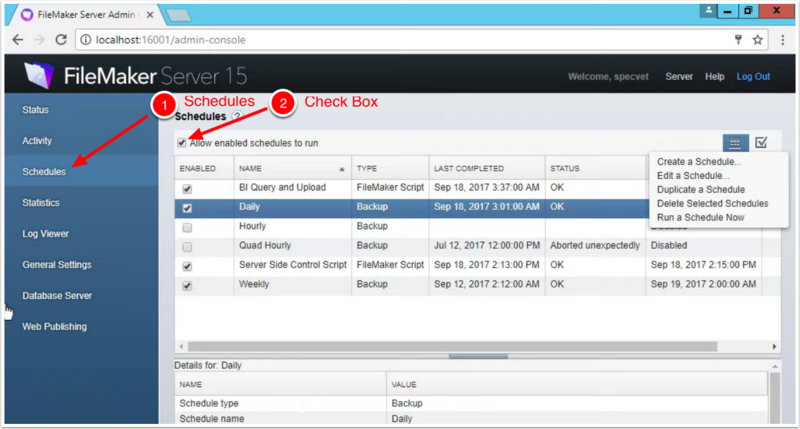 Backup schedules will show "Backup" in the Type column. All of the backups save the same data, so the choice isn't critical. Click the calendar icon on the right side of the window. Select Run a Schedule Now. Once the backup has started. The status for that backup will change to "Running." It's important to wait until the backup has completed before continuing. NOTE: Depending upon the age of the SpecVet deployment and activity level of the clinic, the backup can take several minutes. Typical backup times range from 5 to 20 minutes. Once all clients have been disconnected and the backup has completed, the database files can be closed. This is the critical step to prevent unnecessary delays in reopening the files after the server reboot. Select Activity from the sidebar. 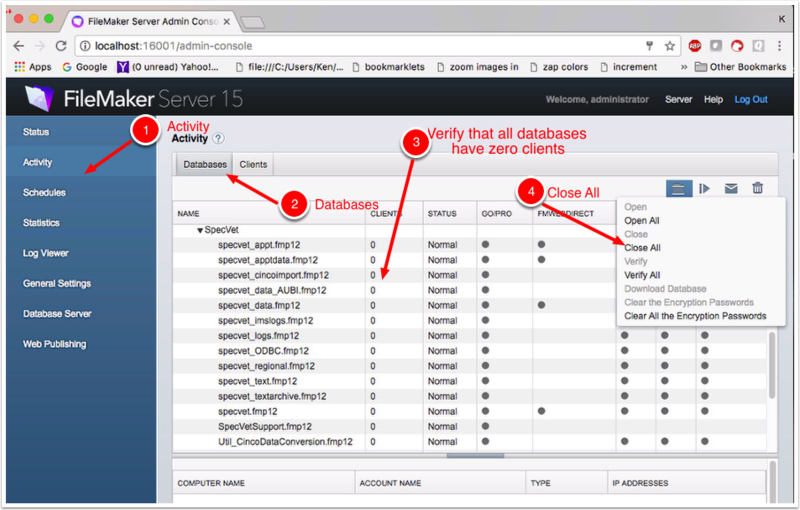 Verify that all databases have zero (0) clients. Select Close All from the dropdown menu. After the Close All process has begun, the Status of the SpecVet database files will change from Normal to Closing, and finally to Closed. Wait until all files are Closed before proceeding. Now that the databases are closed, client connections can be reinstated. Clients won't be able to access the closed files, but performing this step now saves time after rebooting. Select Database Server on the sidebar. Select the FileMaker Clients tab. Uncheck the box to Limit number of FileMaker Pro client connections. Like unlocking the client connections, re-enabling the schedules will now will save time later. Check the box for Allow enabled schedules to run. 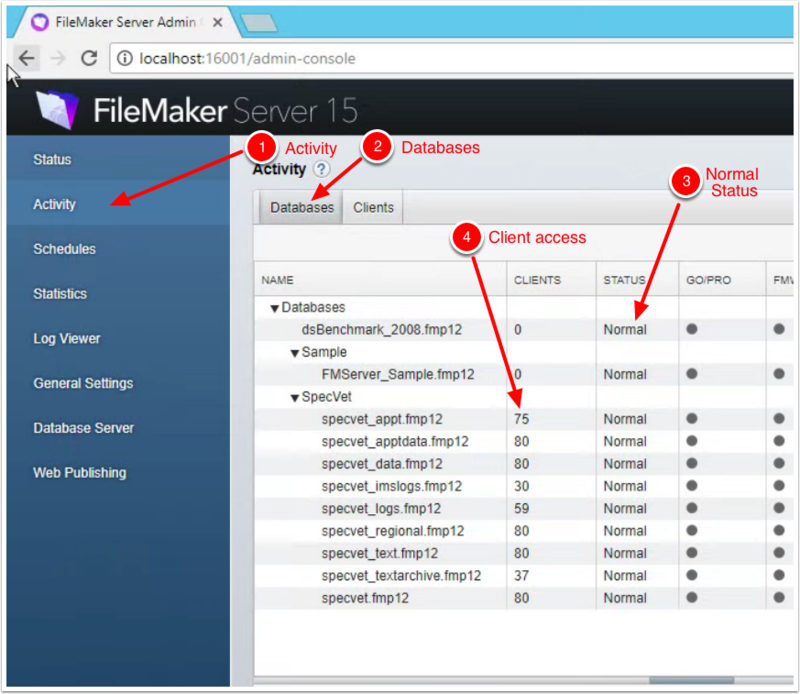 The final step before rebooting is to turn of the FileMaker Server in the Admin Panel. This is essentially the same as turning off the service in Windows using the Services Control Panel. Select Status from the sidebar. Click the on/off button on the right hand side. The Stop Database Server dialog window will open. Change the Delay Time to zero (0). This is not mandatory, but it will speed up the shut down. The databases have been shut down and it is now safe to shutdown or reboot the server operating system. Once the system restarts. 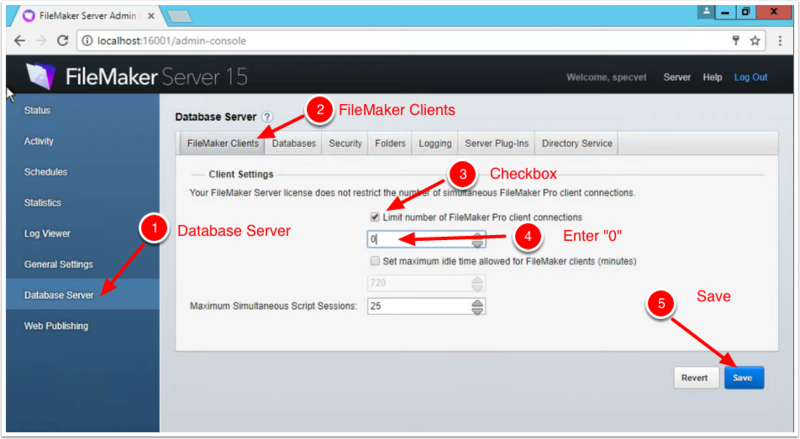 FileMaker Server will automatically load and open the databases. 15. 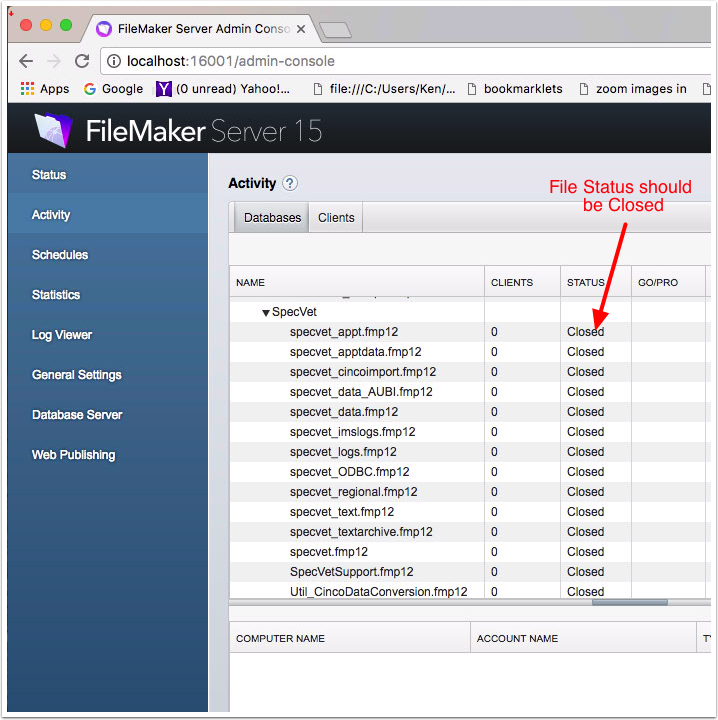 Reopen the FileMaker Admin Console and Verify that all databases are open and clients have access. Reopen the Admin Console and login using steps 1 through 4 above. Check that the statuses of all the SpecVet database files are normal. Verify that clients are connecting to the databases.